This week’s recipe for French Fridays with Dorie took me by surprise. I love vegetables, and I love soups and stews. And yet, when I read the recipe through, I felt ambivalent. Even the picture didn’t help. But I carried on. Though Dorie says to use whatever’s fresh in this recipe, I stuck with the vegetables called for, including the lemongrass, because they all looked great at the market. The asparagus and the baby spinach were local. Also in the mix were a Vidalia onion, a leek, carrots, baby potatoes, and shiitake mushrooms. I found the recipe a little vague about how to cut up some of the vegetables. It seemed like the leek and asparagus were left whole, but I don’t like having to cut things when I’m eating with a spoon. I ended up thinly slicing the quartered leek and cutting the (unpeeled) asparagus spears into 2-inch pieces. Also, I used only half the spinach called for because more seemed overwhelming. Because this dish was simply vegetables in broth, I knew the flavor of the broth would be key to the success of the dish. I thought I had homemade chicken broth in the freezer, but instead, I struck gold when I came across a container of duck stock I’d forgotten about. When the pot au feu was done and I tasted the broth for seasoning, I was surprised by how sweet and springy and delicious it was. I loved it! After our violent midweek thunderstorm (fortunately no tornadoes here), the oppressive heat has been traded for crispness in the air (almost like fall, even though it’s June). 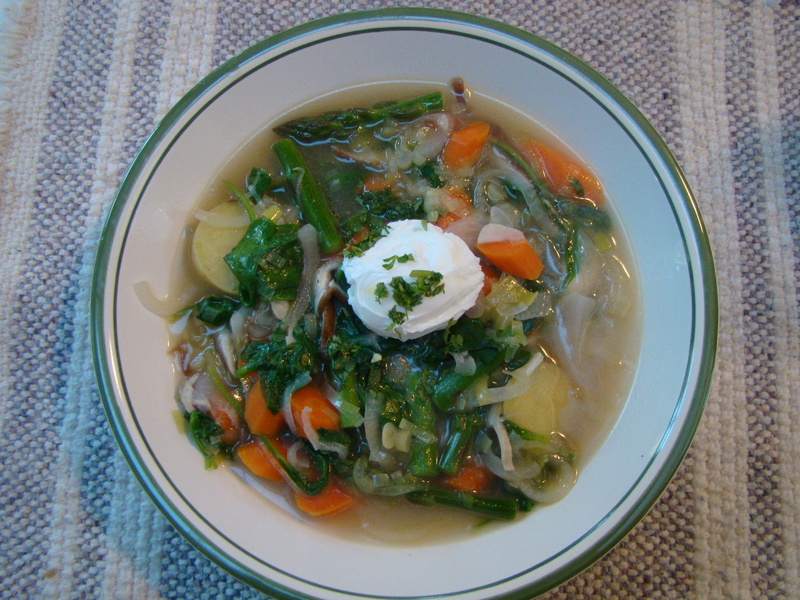 A bowl of light soup was perfect for the cooler weather. I served this in low and wide pasta bowls, with a poached egg in each bowl. I also snipped from herbs from the garden: chervil, tarragon, and parsley to sprinkle over top. I was pleasantly surprised how fast it all came together. Dinner was ready in less than an hour. I did have help. Howard helped with chopping the vegetables and poaching the eggs. He also made some quick guacamole to snack on while we cooked. I like having a sous chef! 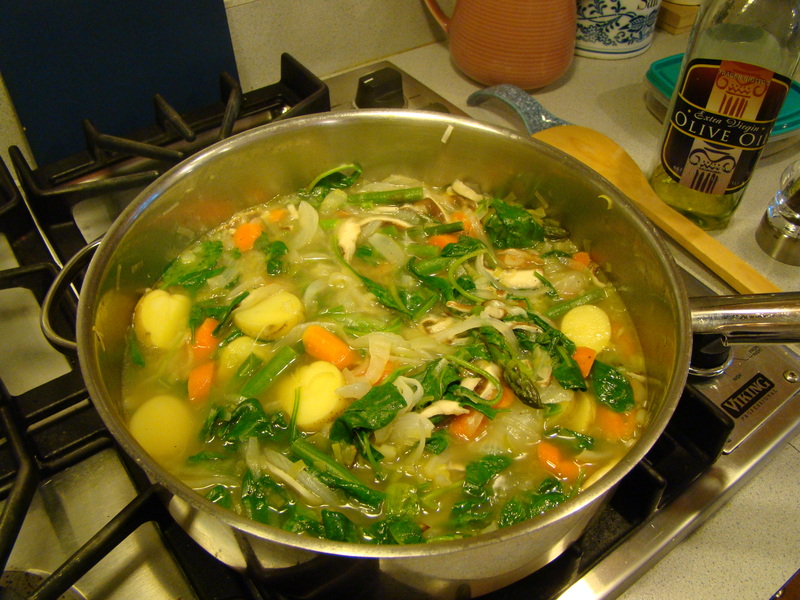 I can definitely see making this one again, varying the vegetables with the season. Once again, even though I wasn’t that excited about the recipe at the start, it turned out to be a winner. Dorie said that leftovers on this won’t be so good, but we only ate half, so we’ll give it a go again tomorrow. I do have a lot of leftover lemongrass. I had to buy a bundle with several stalks, and only used a 2-inch piece. Anyone have suggestions of how to use the rest? One of the high points of my weekends is reading the posts of the other FFwD bloggers to see how they changed up this week’s recipe. Check out their links at French Fridays with Dorie. We don’t post the recipes, but consider getting your own copy of the book, Dorie Greenspan’s Around My French Table. Maybe you’ll even want to cook along with us on Fridays. It’s a blast! Posted on 3 June 2011, in French Fridays with Dorie and tagged asparagus, French Fridays with Dorie, leeks, soup, spinach, spring vegetables. Bookmark the permalink. 15 Comments. Wasn’t this fabulous? I want to dive into your last photo! This soup ended up being a pleasant surprise for me. I’m not sure what to do with extra lemongrass, as I didn’t include that step. If you want to stick with a “Dorie” theme, you can make the Vietnamese soup and add some to it. It’s also great added to meatballs (finely chopped) for an Asian version. The leaves are super wonderful for making tea, even after they’ve dried out. You’ve inspired me! I didn’t get to making this, but I will, and a good use for the lemongrass growing outside my door. I didn’t use lemongrass either but using it up in soup does sound like a good idea. Hi, Betsy! Thanks for the compliments! I like to use those biscuits for shortcake because they’re not too sweet, so they really let the berries shine through. 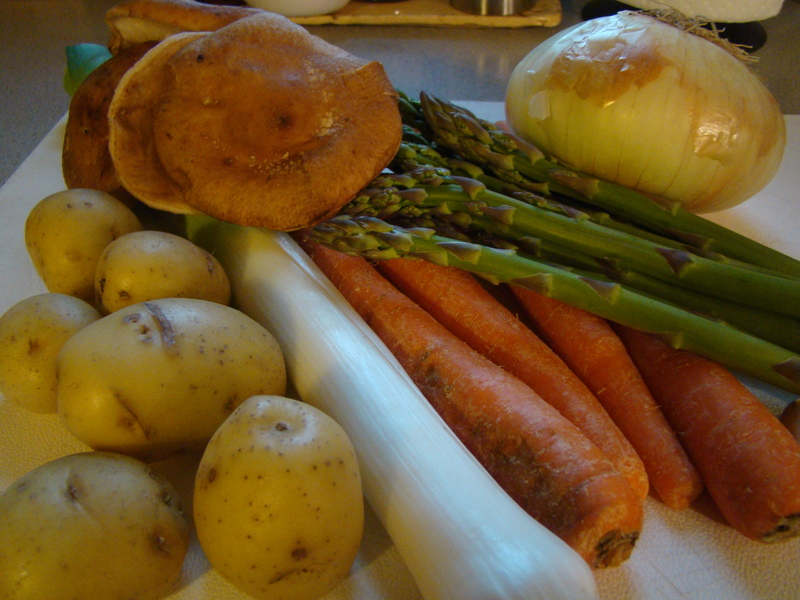 Your Pot au Feu looks beautiful & fresh – the perfect harbinger of spring! Enjoy your weekend! I’m having trouble concentrating on your post, because I’ve been distracted by your Viking gas range! If you’re looking for a way to use some lemon grass, I really enjoyed this recipe: http://www.dinneralovestory.com/salmon-for-people-who-are-sick-of-salmon/#more-10311 It only uses a bit, but it’s wonderful. This was very good wasn’t it. So fresh and so easy to adapt to whatever veggies are good. Definitely a repeat here. Especially since ONE POT!!! Your pot au feu looks so good, Betsy. I am with you – I don’t like whole vegetables in my soup. I bet the vidalia onion gave it a nice sweet taste and certainly the duck stock was flavorful! Mmmm…makes me want to have a bowl right now. This looks fab Betsy. I haven’t had a chance to make it yet and definitely feel ambivalent about it, but you have inspired me. Tomorrow I will get around to it. The duck stock sounds delicious. I love that you have a sous chef. Duck stock! Oh wow, Betsy! I think you can freeze the lemongrass stalks you won’t be using. It’s hardy like ginger, and will probably keep well. I add some whenever I make red curry, although I’d love to find a fish en papillote recipe that calls for some. Dorie does have the coconut lemongrass braised pork recipe you could pull from the book and “make ahead schedule”. Weren’t those thunderstorms something else this week? I have some catching up to do. I have been away and missed 2 of the Dorie picks. Yours looks wonderful and I can’t wait to try it. Nice post.